If you follow any of the younger Chinese actors, you probably already know about this news: Zhang Han more or less announced that he was dating Gulinazha, his costar from the upcoming The Classic of Mountains and Seas (山海经之赤影传说). The Weibo post is just a photo of the two kissing in front of a passing bus, with a simple message saying “Rat loves Monkey” (referring to their zodiac animals) and tagging Gulinazha, but it’s a low-key and sweet way to go public. 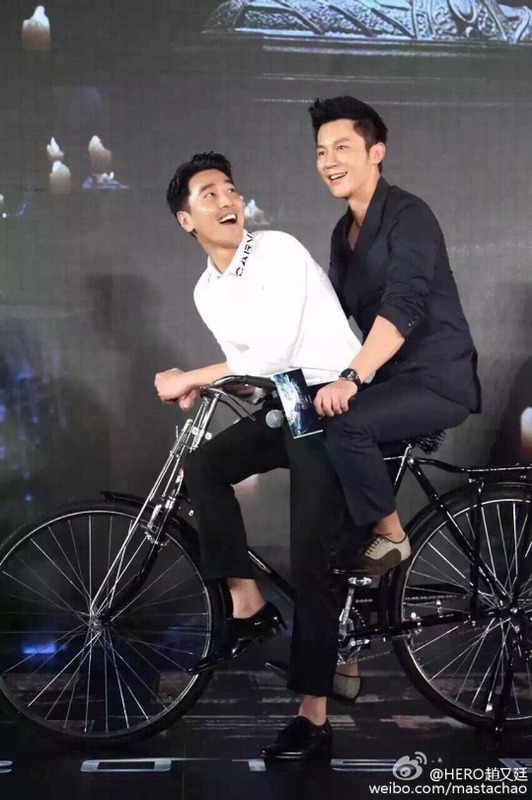 In other relationship news, Mark Chao posted a photo of him and Li Chen posing on a bike and tagged Fan Bingbing, who began dating Li Chen about 2.5 months ago. In response, Fan Bingbing brought the matter to the attention of Gao Yuanyuan, Mark’s wife. Kimi is going to be a big brother! On Chinese Father’s Day (because August 8 sounds like “dad” in Chinese), Jimmy Lin posted a photo of him, his son, and his wife Kelly Chen, announcing that they are expecting a second child. Congrats to them! This year’s Father’s Day was very special, because a new member is about to be born into our family. Kimi will become a real big brother! In the future, they will joke around together and grow up together. This should be the best Father’s Day gift I have gotten! Already in possession of a younger sibling, fellow Where Are We Going? Dad veteran Cindy Tian Yucheng is as cute as always. 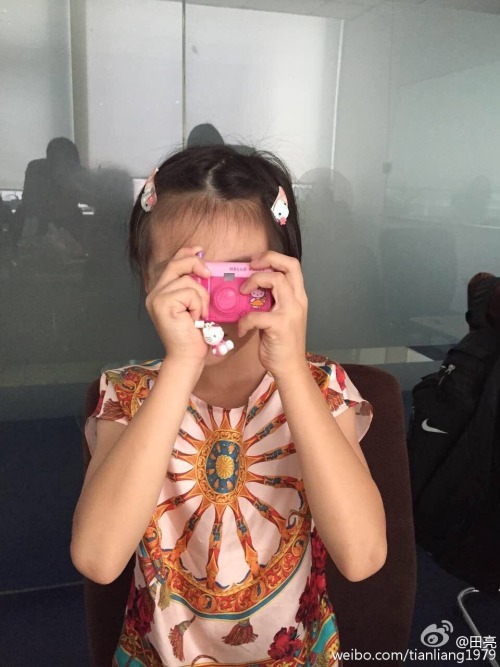 In this photo posted by dad Tian Liang, Cindy is crazily snapping pics of her photogenic dad (we would do the same), without realizing that… the camera lens isn’t open. Bao Bei’er shows us how to cosplay Wuba, the adorable demon monster from the Monster Hunt (捉妖记) movie starring Jing Boran. Not sure if this cosplay is cute or just disturbing. 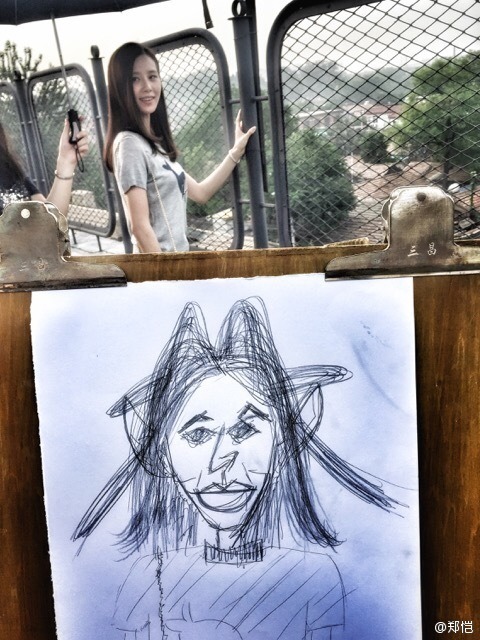 When filming Precious Youth (那年青春我们正好), Zheng Kai tried drawing a picture of Liu Shishi, only to end up with… uh… this. So much fail. 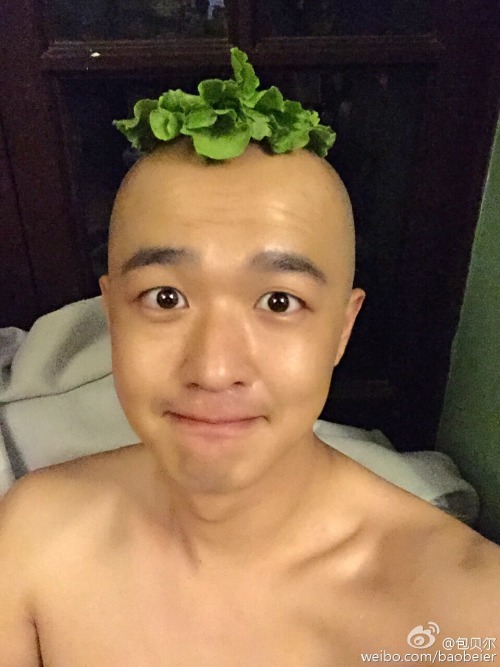 This entry was posted in Miscellaneous and tagged Bao Bei'er, Cindy Tian Yucheng, Fan Bingbing, Gulinazha, Jimmy Lin, Kelly Chen, Kimi Lin, Li Chen, Liu Shishi, Mark Chao, Monster Hunt, Tian Liang, Weibo Wednesday, Zhang Han, Zheng Kai by Jo. Bookmark the permalink. Although my love of HanShuang had not ended yet, I wish those two (Nazha & Han) a happy relationship. Jimmy Kimi Timmy? So cute <3 I think it would be adorable if all the dads from Dad 1 went on Daddy again with their younger kids someday.